Description: This listing is for ONE set of grips. Buyers, however, may take any number of extras we have on hand at the same per-set price and with no additional shipping charges. The Mauser Werke model HSc was an excellent pistol, prized by German Officers in World War II, and even more so by Allied captors. Many U.S. servicemen got them with broken grips, and we have seen more than one specimen with grips fashioned from airplane windshields. The HSc has been spasmodically produced, most notably by Mauser for Interarms in the 1960s and 1970s, and those are the most desirable post War pistols. Neither magazines nor grips are easy to come by for the HSc pistols. Here are credible, well made aftermarket grips to fit the HSc standard 7 or 8 shot .32 or .380 ACP Pistols. Manufacturer is Triple K of San Diego. Construction is high impact, checker molded black polymer. These grips will only fit the standard 8 shot HSc in .32 ACP, or the 7 shot .380 caliber HSc. They will not fit a Mauser HSc Super because its grip frame is much larger than the standard original HSc. They will Not fit a Walther, will Not fit a Beretta, Will Not fit the dump lever of a 1947 John Deere Manure Spreader. They will only fit Mauser HSc pistols that accept a straight line magazine. 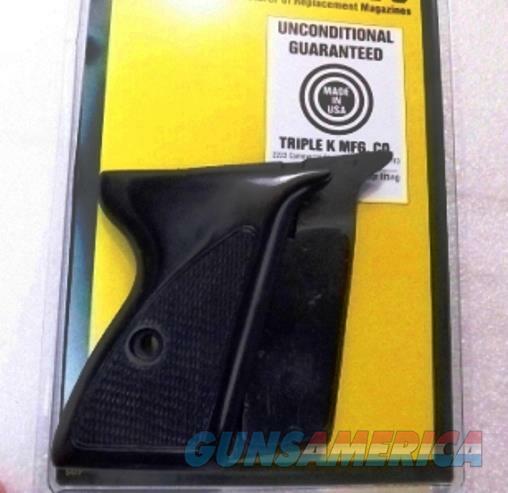 We’re offering these brand new, excellent quality Triple K grips, each pair	for only	$ 39.00. $3 Lower 48 First Class Mail Padded Envelope; $10 Priority to AK HI PR.